The first edition of Birds of America was created between 1826 and 1838 using a printing process known as engraving. Using a press which exerted a great amount pressure, the designs which were etched into copper plates were printed in black ink onto heavy paper. Afterwards, the prints were hand-colored by skilled painters using watercolors. John J. Audubon originally created his series of prints with the assistance of master engravers Robert Havell Sr and his son Robert Havell Jr. 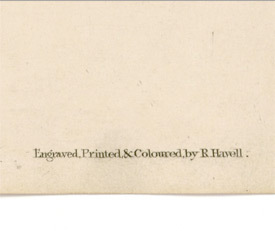 The complete set of Havell engravings is commonly known as the “Double Elephant” folio and/or The Havell Edition. The term “double elephant” was a printers term referring to the largest paper available for printing at the time. These engravings are the largest of the valuable Audubon prints and measure 39.5″ x 26.5″. 435 images comprise the Havell Edition and approximately 175 folios were created. They are on J Whatman paper and bears one of two watermarks that can be difficult to see. When the print is unframed, backlighting should reveal the faint mark located in the margins. Hold the print up to a lamp or other light source (not fire, of course) and the watermark should illuminate, though often very faintly. Another method is to shine a light at an angle onto the front of the print. This can make the impression of the watermark appear with shadows. Sometimes, the aging of the paper and/or it’s treatment through during it’s history may cause the watermark to show to the naked eye. Over the years, many backs of the prints have been glued in the process of framing rendering their opacity nearly 100 percent and the watermark no longer visible in this manner. Unfortunately, many original subscribers in the mid-1800’s chose to cut down the original large paper, perhaps to fit existing frames. Many times this resulted in the trimming off of the watermark. This significantly reduces the value of the Audubon print and creates a challenge to authentication.